For Monday, if your class has not already done so, be sure to complete goal set 2 as homework. As announced in your class we will take a quiz over goal set 2 from unit 5. When announced please take notes on PODCAST 3 – The Impulse-Momentum Theorem. We will complete assignment 3, the Impulse-Momentum Theorem Lab, and goal set 3 on our way to our unit test, which will likely be next week. Silent space: Did you know that every science fiction movie that allows you to hear a blast is boldly lying to you? Sound waves need a medium to travel through, so in the vacuum of outer space, there’s no sound… or is there? A plasma physicist has discovered that charged particles interact with Earth’s magnetosphere to create a different kind of sound wave, a magnetosonic wave. These waves are very low in pressure and are therefore undetectable, but they can affect satellites. Below the awesome gif is an audio file that makes these space sounds audible by condensing a year’s worth of sound into six minutes. Check it out! On the audio below, click on the white lines in the lower right to hear the sounds after clicking the play button in the top left. Alternately you can click here to access the researcher’s external site. This will be a shortened week as we observe Washington’s and Lincoln’s birthdays on Presidents’ Day, which Ohio officially calls Washington-Lincoln day. Who knew? Last week Elon Musk‘s SpaceX launched a new rocket model into space. The Falcon Heavy rocket has the cool feature of returning its rocket boosters back to Earth in a way that allows them to land for reuse. You can check out their synchronized landing at the end of the short video clip below – so cool! Also super cool: The Falcon Heavy, while in space, released into an orbit around the sun a Tesla Roadster, an electric car from Mr. Musk’s other company, Tesla. 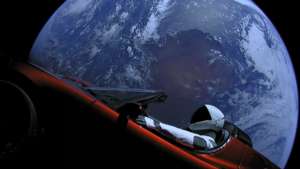 In the Roadster: an astronaut mannequin named Starman. On the dashboard: a sign that says “Don’t Panic.” Music playing in the car: Starman by David Bowie, natch. The following is a real picture! Ridic! For Monday please complete assignment 1. In class on Monday we will go over assignment 1 and will put the finishing touches on our law of conservation of momentum experiment. On Tuesday we will take a quiz over goal set 1. (If your class does not finish going over goal set 1 in class on Monday it will be due on Tuesday.) As announced please take notes on PODCAST 2: Types of Collisions – The role of kinetic energy. We will complete assignment 2 and will reprocess our data from our mini law of conservation of momentum lab from the perspective of analyzing the types of collisions. By the end of the week we will take a quiz over goal set 2. We may be ready to take notes on the last podcast of the unit by Friday, but with scheduling for next school year taking place this week, it is likely that you will take notes on that for next week. Stay tuned! Here is the link for the 2018-2019 ALHS Program of Studies. Scientists rock, and now a record number of scientists are running for political office, walking in the footsteps of Sir Isaac Newton, who served as a Member of Parliament after achieving success in the fields of science and mathematics. We will take our unit 4 test either on Monday or Tuesday as announced in your class period on Friday. Due on the day after you take the test, please take notes on unit 5’s PODCAST 1: The Law of Conservation of Momentum. We will go over this in class, do assignment 1, complete an informal lab activity, and take a quiz over goal set 1 as announced. If announced please take notes on PODCAST 2: Types of Collisions – The role of kinetic energy.